It’s the most wonderful time of year which means holiday get togethers, spending time with your favorite people and delicious food! Today I’m sharing a simple and fun appetizer featuring Kettle Brand chips. All things potato have been my favorite food while pregnant. So when Kettle Brand asked me to partner together to help promote their new Almond Oil chips it was an easy and ecstatic yes! 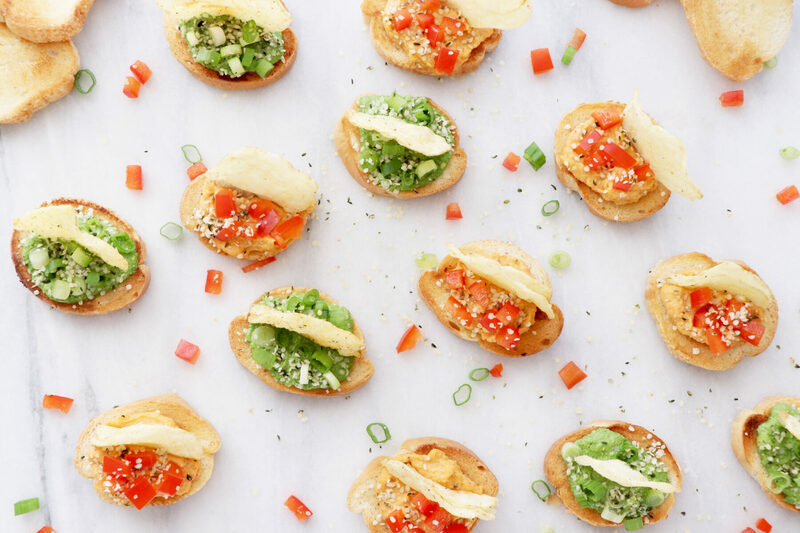 These chips taste amazing on their own but I thought with the holidays coming up why not turn them into a fun appetizer! The first is a Crostini topped with Roasted Red Bell Pepper Hummus and Wood Smoked Sea Salt Kettle Chips cooked in 100% Almond Oil. The second is a simple dairy-free Pesto made with Hemp Hearts topped with Fiery Thai with Lemongrass Infused Salt Kettle Chips cooked in 100% Almond Oil. I love that Kettle Brand potato chips are made with real, simple ingredients and are also NON-GMO Project verified. Add all ingredients to a high-speed blender or food processor and blend until smooth. If hummus is too thick, add water or olive oil 1 tsp at a time and continue blending. To make crostini, cut fresh baguette into slices about ¼ thick, brush with a small amount of cooking oil of choice and toast in a skillet or the oven, till browned but not burnt. Add all ingredients to a small food processor or blender and blend until finely chopped/blended. If pesto is not blending, add olive oil 1 tsp at a time and continue blending. Disclosure: This post is sponsored by Kettle Brand. Opinions are my own. We only share about products we genuinely love and believe our audience we also love to learn about!